Take five Englishmen, two Spaniards, two Swedes, an Irishman, a Dane and an Italian. Pick a Danish non-playing captain and dress them all in blue with yellow stars. Play the contest on French soil and call it a European team. Then put them against twelve Americans with wives with shiny teeth and all dressed in red, white and blue. No contest? Well as it turned out yes, no contest. But why? Lots of reasons - playing better golf on a course unlike those the Americans will have seen before helped. But surely a comfort with team sports and partnerships helped even more ? Every American player was a brilliant individual - but team player? Nah. In America amongst friends with supporters shouting “In the Hole” and chanting “U S A “ a noisy patriotism helps. But in Europe, and especially in France where there is a healthy scepticism of faux-patriotism and a fear of nationalism ? No sir. The EU flag is the flag of Europe but it is not a patriotic symbol. On the contrary it is a symbol of a conscious bias AGAINST nationalism. It’s the polar opposite of the Stars and Stripes. The underlying premise of European integration is shared sovereignty and shared accountability. A brilliant Italian and an eccentric long-haired Lancastrian formed an unbeatable partnership. They pooled their strengths and helped each other minimise their weaknesses. A metaphor ? Well maybe that’s a step too far... but maybe not. History teaches us that working together, having alliances, forming partnerships can be difficult and that leads some to think that going alone is preferable? Taking back control is better than working out our differences some would say. But history also teaches us that closing borders, rather than opening them and nationalism rather than internationalism can be deadly. 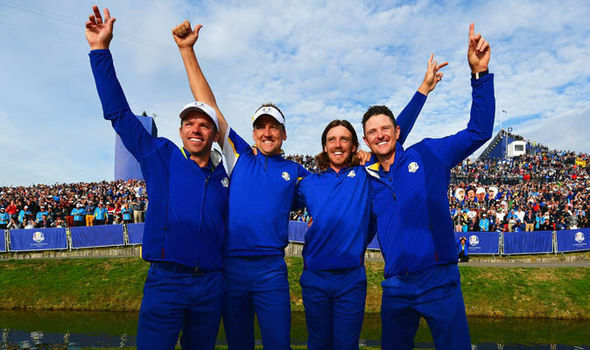 The European Ryder Cup team won not in spite of their differences, but because of them. The Americans lost because they were all the same. Individuals. Flag-waving but shallow. Gleaming white teeth but empty hearts. Dollar bankers where success is measured by the size of your winnings not who your friends are and how good a team player that makes you. Ground for concern at Tottenham Hotspur ? During my Shell career I was from time to time involved in major capital projects - usually indirectly, once or twice closer to home. Almost without exception these projects cost more - often a lot more - than the original estimate and took longer - often a lot longer. Now Shell was in the big league where such projects were concerned. For a time we were the largest private sector investor in the world. We were pretty good at what we did, it was just that management of major projects is very, very difficult. I mention this to say that I am sympathetic to the challenge that Daniel Levy, Chairman of Tottenham Hotspur and his Board have faced with the new Spurs stadium. It hasn’t been easy. It never is. And unlike Shell Levy and Co. have no prior experience, though no doubt they have employed many contractors and people who have. I don’t think sports stadiums are inherently more subject to cost overruns and to delay than other building projects. It tends to happen though - remember Wembley ? Cost and timing are inextricably linked. Spurs wanted the new ground to be ready for the beginning of the 2018/19 season and this became a firm target. As it seemed to be slipping extra efforts were made, and this cost money. If you’re a jobbing electrician £400 a day is on offer now to help complete the work before the end of this year (my guess as to the real target now that the revised original one has been missed. Spurs haven’t been helped by cost increases from the decline of the pound either - many items are Euro or Dollar denominated. If I am sympathetic to Spurs Chairman it is in part because he has achieved so much. To create a world class venue on the very site of the old White Hart Lane is an astonishing achievement. It required acquiring land all around Spurs N17 home and overcoming demanding planning objections. Levy has been very smart and Spurs fans have been lucky to have him. Call me an elitist but I’d rather have him with his Economics degree from Cambridge than the average Club chairman ! That said recent weeks have not seen Levy nor the Club at its best. A football club’s principal stakeholder has to be its fans with season ticket holders the most committed of these. Many of us made special arrangements to be sure that we would be able to be present at the first match at the new stadium originally planned for September 15th. We received little more than one month’s notice about the change. Spurs are generally pretty good at stakeholder communications but over the new stadium timetable and cost we have been kept in the dark. It is hard to avoid the conclusion that the Club’s inactivity in the transfer market has been in part caused by financial concerns about the stadium’s escalating costs. You can factor the delays into this as well. Up to a point you can buy your way out of time pressure trouble in projects by committing more resources - but at a cost. Spurs have played the safety card recently to help explain the delays. This strikes me as disingenuous. Any construction project in modern times builds safety in from the start. Similarly in respect of architectural design. Last minute safety concerns just weeks away from the planned opening, the Club’s explanation for the delay, should not have happened. If it did. The suspicion is that the Club used safety as an excuse because nobody could challenge that safety comes first. It has the smell of a bit of a cover up to me. It’s going to be a difficult few weeks for Tottenham Hotspur. Uncertainty of dates and venues is disruptive for fans and players alike. If the team weather this storm by stringing some decent results together they will do very well. Come the dawn the future for the Club is bright. All the signs are that the new White Hart Lane will be magnificent and despite the transfer inactivity the squad is outstanding. To me only one thing is lacking and that is greater financial security in the short to medium term. In the long term a 60,000 seat stadium in London should generate huge revenues - and not just from football. But just now the Club is very stretched and if a white knight emerged as a minority investor with a nice slug of ready money surely that would be welcome. I’m sure Dan Levy knows this and is on the case ! The rationale for the new competition and new format is apparently that it will bring a new audience to cricket. Spectators (and TV viewers) will come to the game because of its razzmatazz. This may be true. But will they come in greater numbers because each innings is 16.4 overs rather than 20? Will the disappearance of 20 balls per innings really make that difference? I support the idea of a city-based T20 franchise competition in the U.K. based on the IPL/Big Bash (etc.). The format of these competitions is well-established and it seems to work. It widens the support base of cricket in India/Australia and brings in the crowds. So why would the ECB not simply clone the idea (as I assumed they would do)? Why do we need to create a new format ? The answer to this question is not the one the ECB give - to bring in new spectators. This is bunkum. “I wouldn’t go to a Twenty Over cricket match but I would go to one in which they play 16.4 Overs per side” says nobody. There are not people whose attention span would last for 100 balls but not for 120. Or if there are they should be seeking care. T20 is an established format and a proven success around the world. Here in England and Wales it is also successful but with 18 counties and matches played in some very “Non IPL” type locations it does not have the focus or the commerciality of the 8 team competitions played elsewhere. The counties have been told they can keep this competition when the new franchise tournament starts in 2020. Here we get to the heart of what is going on. To have an 8 team T20 tournament in the U.K. based on the IPL with free to air TV coverage and lots of hype would inevitably detract from the Counties T20 competition. And that is why some bright spark came up with the idea of making it not 20 overs a side at all but 100 balls! The counties keep their exclusive rights to the “T20” brand! Cricket has always been played in a variety of formats. Limited overs matches have varied in my lifetime from 65 to 60, 55, 50, 40 and finally 20. There is nothing inherently wrong with having another variant. Except that there is no need to do it and plenty of reasons not to. The three format world of professional cricket (The two innings First Class game; the 50 over a side One Day (“List A”) game; the 20 over per side (T20) game) is well established). Each has its own familiar character and style - and (importantly) each has its own records. 100 balls per side would not be T20 so neither performances nor results would feature in the T20 records. This matters, not least to players. So the explanation that 100 balls rather than the established 20 overs will bring in more spectators is surely disingenuous film-flam. If it was true then why not make the Counties T20 tournament 100 balls as well ! No the only conceivable logic is that it could be presented as entirely separate from T20 so that the counties could claim that if you want to see a domestic T20 match theirs is the only offer. And that is seriously perverse.